If you're even remotely interested in the fantasy genre, you'll know that the single biggest and most notable high fantasy stories of the past generation have been J.K. Rowling's Harry Potter series, also adapted into a series of highly successful films by Warner Brothers. It is as many of us already know the story of a boy who finds out that he has the talent to become a wizard, and goes to magic-school in order to learn his craft and ultimately winds up becoming a great hero in the process. Most people are more likely to have seen the films, but they really do not deviate all that much in story as far as film adaptations go. There is however a much earlier fantasy series with the same basic premise, the Earthsea Cycle by American author Ursula K. Le Guin. It's a little less well known, and its film adaptation was utterly horrible for many reasons that I won't go into here, but the first book is, I think, perhaps a good place to start off my reviews. A Wizard of Earthsea was first published in 1968, and has become widely recognised as one of the greats of fantasy literature in years since. There are a few reasons for that, and it stands out in just about every area you'd care to mention, including the characters, the story itself, and the world that it creates in order to draw you into its setting. Upon rereading it for this review, I was quickly reminded why and how the story was so great, and why I remembered it as one of the truly great stories of fantasy literature. It has since its publication received numerous awards, and was at one time voted as being the third-greatest fantasy novel of all time in a poll of pre-1985 novels, being beaten only by The Hobbit and The Lord of the Rings. 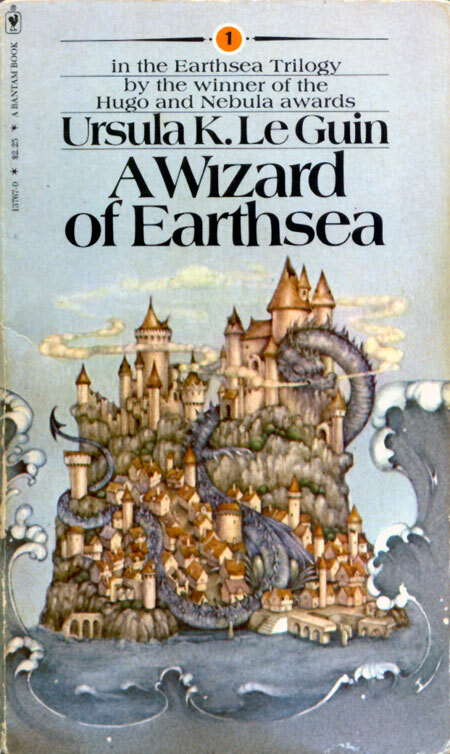 A Wizard of Earthsea was soon followed a second novel called The Tombs of Atuan in 1971, and a third called The Farthest Shore in 1972, completing what was then called the Earthsea Trilogy. A fourth novel, Tehanu, turned up in 1990, but was less well-recieved. When it comes to the plot, A Wizard of Earthsea is straightforward in its basic concept; it's the tale of a boy who discovers that he has magical potential, and whose ambition outstrips his early teachers' ability to teach him to the point of his being sent to the wizard's school on the Island of Roke so that he might acquire the power he craves. But his ambition outstrips his ability to control his power, and he ultimately winds up summoning a dark entity into the world, which hunts him throughout the rest of the novel and serves as a symbol of his original carelessness. All this leads to an ending which is not something I'd like to spoil here, but it's a rare example of a fantasy story where there actually is no single clear villain and ultimately the protagonist is not fighting to save the world, but merely to save himself from a dark fate. The story itself strikes a balance between excitement and wonder, exploring its world fantastically and presenting its events without sacrificing style. Since it's a relatively short novel with most copies coming in at least than 250 pages, it moves fairly quickly and doesn't get bogged down in many of the more unnecessary details that fantasy novels often have a tendency to. Our protagonist is a young man called Ged (or Sparrowhawk) and the story follows him from a young age up until his adulthood. He is at first an ambitious and actually at times unlikeable protagonist, someone so obsessed with acquiring power that he'll go to any lengths to achieve it, but who eventually discovers that his powers have a cost. The novel does a good job exploring his growth as an individual and it leads to a satisfying conclusion when he eventually grows into the wizard that he ought to be. Most of the novel follows his travels alone as a wizard, and Le Guin succeeds at making him interesting enough to carry the story on his own. There are only a couple of major supporting characters. The first is Ogion, being one of Ged's first teachers and someone who helps him to see the solution to his dilemma. And the second is Vetch, a close friend of Ged's from the magic school at Roke who eventually joins him in his final quest. Beyond that most of the cast is fairly transient as the plot moves from place to place, though there are a few interesting minor characters, the majority of the novel follows Ged's journeys and there are only a few recurring figures. When it comes to worldbuilding, A Wizard of Earthsea is a fairly unique example amongst fantasy stories, as it centres not around a conventional Mediaeval Europe inspired setting but in fact around an islander society. Earthsea is a vast archipelago, and people in the world itself are more likely to travel by boat than by horseback. One additional fact of the setting, very often left out of adaptations, is that the people of the setting are almost always people of colour, with white people being few and far between. The few white people in the novel are presented as barbaric raiders who at times resemble Vikings. Another interesting point of the setting itself is the ubiquity of magic, and sorcery is often recognised as a simple fact of everyday life in the setting itself. Most islands and villages have a nearby mage, and the magic itself forms a fundamental theme of the book. The magic in Earthsea is centred around the Old Speech, and most things in the setting, from characters to animals to objects, have a 'true name'. A wizard can use the true name to gain power over that object, from dominating the minds and actions of individuals to transforming them into animals. For this reason most characters naturally keep their true names a secret, with Ged often going by Sparrowhawk for example, and it forms an interesting theme of the story itself as the issue of names is often called into question when it comes to the shadowy entity that pursues Ged. I mentioned that this novel is widely recognised as one of the greats of fantasy literature, and I am very hard pressed to find reasons to disagree. The novel was greatly enjoyable, and I recommend it to anyone who has any interest in fantasy. If you enjoyed Harry Potter, this is a good novel to continue with, so that you might see where the stories of boy wizards actually started off. Ultimately I give A Wizard of Earthsea the label of a Must Read story. It is such a great and influential part of fantasy literature that most fans owe it to themselves to read it.